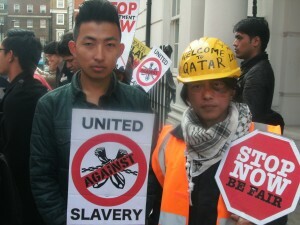 Horrified at the treatment of their countrymen in Qatar, members of the Nepali community in London gathered outside the Qatari Embassy this weekend to protest against the conditions experienced by migrant workers in the Gulf country. The protest follows on from a series of articles published in The Guardian newspaper last month, which exposed working conditions tantamount to slavery at construction sites in Qatar. The Guardian investigation uncovered evidence of forced labour at infrastructure projects linked to the FIFA 2012 World Cup in Qatar. Workers had had wages withheld and passports confiscated by their employers, while some had even been denied access to drinking water in the desert heat. "Over 600 workers were sharing just two kitchens in the labour camps, can you imagine it? Nepalis in Qatar are just trying to make an honest living, but they are subjected to the most inhuman and degrading conditions. The Qatari government should be ashamed" said Shreya Paudel, one of the organisers of the protest and former president of Middlesex University's Student Union. "This is just the beginning. 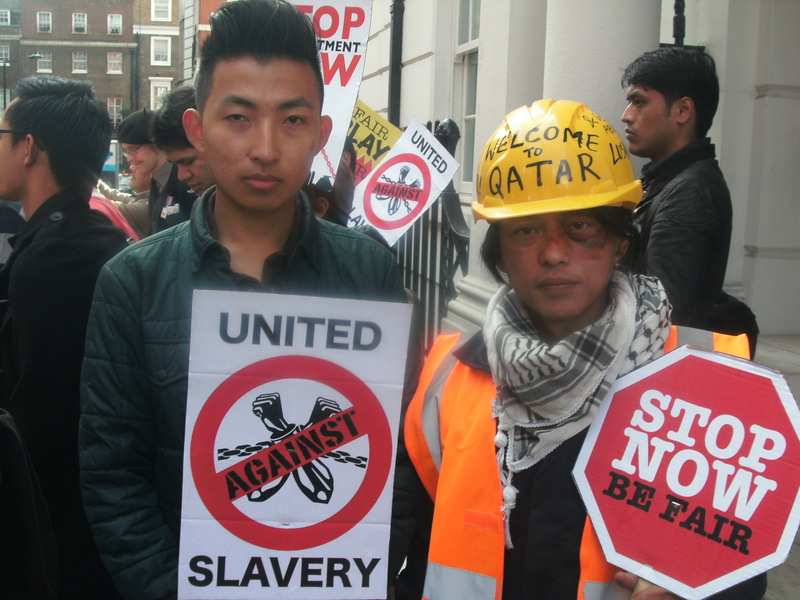 We'll be organising more events in London to put pressure on the Qatari government to crack down on the abuse of migrant workers." Details of further gatherings will be posted on the event's Facebook page, which will remain open. London-based artist Subash Thebe, who hails from Dharan, Eastern Nepal, said that he was attending the protest in solidarity with fellow Nepalis. Thebe dressed in a keffiyeh, helmet and high-vis jacket - the unofficial uniform of construction workers on Gulf building sites. "I find it hard to believe that in the 21st century people are living in such conditions and not even receiving a paycheck for their work. It's disgusting. This is not just about Nepali workers - there are Bangladeshis, Indians, Pakistanis, people from many different countries working on building sites in Qatar. We must speak out for them too" he said. Among the protesters was Janine Booth, representative of the Union of Rail, Maritime and Transport Workers. Booth has subsequently persuaded Labour MP Jeremy Corbyn to submit a motion before Parliament tomorrow to outline the inhumane conditions faced by construction workers in Qatar.